Have you ever noticed how the best adventures are often those that are unplanned? That’s what happened to me recently. What began as a simple outing for an art show and lunch in El Paso turned into a stellar day. I can’t wait to go back. Up until yesterday, I thought of El Paso as a city filled with pollution, poverty, drug wars and street violence. We are, after all, talking about a city that shares a border and entry point with Cuidad Juarez, recently known as “Murder City” due to the drug wars that raged there not too long ago. I thought it would be a bleak city, but I was wrong. Here’s what happened. El Paso Museum of Art Sculptures: note this handsome couple visiting – one head a hand and the other a cow’s jaw…. The museum also has a pretty big collection of historic European art such as this painting, “The Offering of Noah,” a painting from the mid-1600s attributed to Salvatore Castiglione. What I love about this painting is the impish and unfrightened faces of the people who are looking up at God. I walked through two rooms of paintings of this genre, thinking they were done by European masters. But no. Much of the religious art shown was actually done by indigenous tribespeople taught to paint in the European style to help the Catholic priests decorate their churches after they began arriving in the 1600s. A good selection of western artwork was also on display, such as this painting of Guadalupe Peak done in the 1930s by Seth Floyd Crews. Guadalupe Peak by Seth Floyd Crews in 1930s. Another room featured the work of Tom Lea, a well-known muralist, World War II correspondent, artist, writer and native El Pasoan. A prolific artist, Lea’s murals can be seen throughout the United States, and his chronicles of war were published for years in Life magazine. A cowboy painted by El Paso native Tom Lea. A large portion of his work is focused on the southwestern areas of Texas and Mexico. This cowboy to the right is just one of many styles he worked in. This painting sort of set the stage for a later foray in the El Centro, El Paso’s downtown shopping district, where modern-day versions of this gentleman were present in large numbers. Let’s just say that you don’t want to miss El Centro. This multi-block of sidewalk stores reminded me very much of street shops in Manhattan except that in this case, almost every sign was posted in Spanish. It’s nestled right next to the Arts District and a row of both decaying and refurbished hotels where the likes of John Dillinger and other notorious celebrities have stayed in years past. It’s also less than a mile away from the border crossing, which makes it a convenient shopping stop for many visitors from both sides of the Customs entry point. You can buy anything here, from fresh produce to Mexican delicacies and household goods to rhinestone-covered evening gowns. We ventured into Starr Western Wear, a huge department store crammed with racks of cowboy shirts, jeans, boots, belts, hats, you name it. The store is conscientiously attended to by a swarm of friendly clerks whose Spanish is far better than mine. Broken as my words were, they managed to find just what I wanted. One of the best stops in El Centro was Dave’s Pawn Shop, shown below. The bright red and gold paint job on this store made it stand out all on its own, even without the life-sized singing Elvis. We should have more of singing Elvises around shopping areas – they have a way of loosening up your morals and your wallet. Ewwww! Pancho Villa’s trigger finger. I’m not sure if anyone knows if that’s really Pancho’s finger, but it can be yours for a mere $9,500. I found other treasures inside the store, such as a set of six shrunken human heads nicely packed in an old wooden box for $695. They looked pretty authentic to me. I also found a human mummy in a Victorian glass display case for only $14,995. As I browsed, I could hear one guy wheeling and dealing with the manager over vintage military equipment he said he found in an alley. Artifacts and all this fine jewelry to boot. Suffice to say, with so much treasure on hand the store was packed. In a pretty high humor on my way back from El Centro, I noticed a curious exhibit of hundreds of pairs of red shoes, all positioned as though someone had been standing in them just one moment before. Zapatos Rojos, a public art installation that started in Ciudad Juarez in 2009 as a march of 33 absent women. The effect was eerie. I moved in closer. This turned out to be a public art installation created by Mexican visual artist Elina Chauvet, featuring more than 250 pairs of shoes that have been collected and painted throughout the Ciudad Juárez-El Paso area. According to the exhibitors, each pair of shoes represented a victim of gender violence, with the color red representing the blood, violence and suffering of missing women. Heartbreaking. Chauvet began this exhibit with a collection of 33 pairs of shoes symbolizing women who disappeared from the streets of Juarez, with red representing their blood. Her exhibit has since gained attention worldwide as a symbol protesting violence against women. Map of El Paso and Ciudad Juarez. Source: UK Daily Mail. Here is the reality. 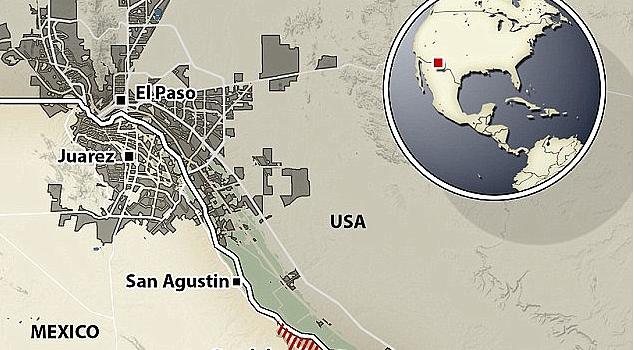 El Paso, with a metro population of nearly 850,000 people, shares a long border along the Rio Grande River with Juarez, population 1.8 million people. Combined, that’s nearly 2.7 million people living side by side, many of whom move across the border all the time to work, visit family, shop and seek medical treatment. Ciudad Juarez has its problems but it’s making its way back from the drug wars. Friends I know who once ventured into Juarez on a regular basis but stopped for those years are now crossing the border into the city again. They assure me it’s fine to visit, but I’m not sure I’m ready for that just yet. El Paso, according to crime statistics, is a very safe city. As recently as 2014, El Paso was ranked the safest large city in the U.S. for four consecutive years, according to the Congressional Quarterly and ranked in the top three since 1997.² It was followed by New York City and Austin, TX. El Paso is also pretty friendly based on my experience. I did not feel unsafe at any time while we spent the day there. I did, however, feel like I wanted to learn much more about the city and its history. To my way of thinking any town that was founded in the mid-1600s has much to share. I’ll be back, El Paso. ¹Katie Amie, “The most difficult PR job in the world? Mexican city once considered the ‘global murder capital’ is now attempting to lure tourists back,” UK Daily Mail, July 2, 2015. ² “El Paso named safest large city in America for fourth straight year,” KVIA.com, posted January 7, 2014, updated June 14, 2014. Should we pool our monies and share that finger to display in our homes.? I have the perfect spot next to the cajones of that cow I purchased in a godforsaken desert shop near Phoenix. Great travelogue, Paula. You’ve found your genre! Oh, the great treasures you have, Lynn! I need to come over and see what’s new! Thank you for the note; I’ll check it out!